7.) a wider side cut angle, though this is hard to evaluate on a finished tree. All the other names are descriptions of specific variations in that basic design. We just use the name Wade and then talk measurements for the different variables. 1.) It is strictly a style of fork. While the first Wade tree brought to Hamley’s in the 30’s and copied by Walt Youngman had a specific style of cantle, bars and fit, the term Wade now refers only to the style of the fork. Wade fork trees do not fit the horse differently or seat the rider differently than other trees because of the shape of the fork. All the Factors That Affect Fit for the horse apply equally to all other styles of fork. The “Wade bars” that are often used with Wade forks generally have a longer bar tip to accommodate the extra stock thickness, and an outline pattern that has more surface area, but all this is independent of the style of the fork. “Wade bars” can be used with other fork styles and other named bar types can be used under Wade forks. Clearance under other fork styles can be the same as on a Wade. (Please see Avoiding the Withers for further explanation.) The seat the rider feels is a result of the work of the saddle maker, not the shape of the fork. 2.) It is a slick fork. A slick fork is widest at the bottom where the fork connects to the bars. If it goes wider and then comes in to meet the bars, it is a swell fork, regardless of the “name” that is on it. Although the original Wade fork was a specific shape and “width”, they are now made in various “widths” from very slick to almost a swell. “Width” is in quotation marks because there is no consistent place to measure a slick fork, so everyone’s “X width” will look a bit different. You have to go by the pictures to decide what you want to order from each maker. We commonly make forks from 8” to 10” wide at ½” increments, though we have made them slicker and we have combined the rest of the attributes of a Wade to make narrow swell forks (which we do not call a Wade). 3.) It has a wood post horn and 5.) thin gullet. If it has a metal horn, it is NOT a Wade, regardless of the “name” that is on it. Because it has a wood post horn, it also has a thinner gullet, bringing the base of the horn down closer to the horse, which is an advantage when roping. Please see our Avoiding the Withers page and our Basics on Horns page for further explanation. 4.) It has a thicker stock and 6.) a higher top cut angle. Traditionally, the Wade tree had a 5” stock thickness and this is our standard for Wades. (This is measured from back to front of the fork. 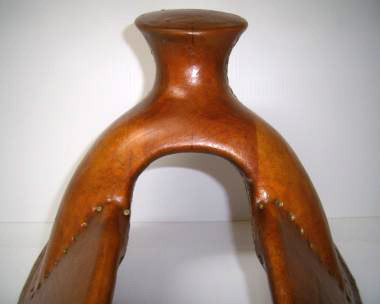 Please see our Measuring a Saddle Tree page for more information.) We make them with other stock thicknesses, but then they are modified Wades. 4 ½” stock is fairly common and often goes by the name Lady Wade or Ray Hunt Wade. We have made them up to 6” in stock thickness. The Wade fork has a higher top cut angle, which means a higher slope from the back of the fork to the gullet lip. This is needed with the thicker stock to avoid the gullet lip looking too downhill, and is explained in our Avoiding the Withers page. 7.) It has a wider side cut angle. Part of what makes the shape of the Wade is the fact that the sides of the fork are not cut at 90 degrees to the back but at an angle. With the rounding and shaping of the forks, this is not readily seen, but it affects the overall look of the fork. The woods we use and how we laminate the fork is described on our Construction Materials page. Changes in gullet height will change the top half of the shape a bit, and differences in bar spread and bar angle will affect how far apart the bottom of the fork is spread, so there can be some variation in the look of a “width” of fork. However, we do keep our “widths” consistent across a horizontal line drawn at the bottom of the hand hole when we are marking them out, and the variations are not large unless you compare the extremes. Horns specs, while they don't change the shape of the fork, do change how your eye perceives it to some extent as well.